For the past week my train rides have not been so good. I love New York City but I really think the trains are getting to me. 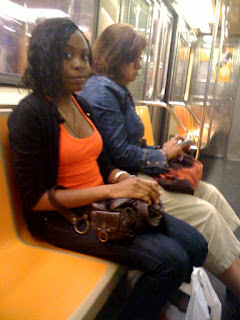 A week ago I rode the F Train Queens bound around 8 in the morning. It was a bit crowded. I figured I'd be sensible and not stand near the door because that just blocks people from entering and exiting the train. So I moved into the middle of the train. There was a semi-empty pole. 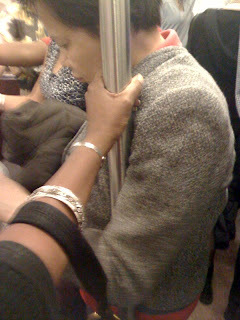 This pole had a woman attached to it,, she was sort of hugging it. There was really no where else I could have stood so I squeezed my hand through the pole and her body and said "excuse me." She proceeded to hug the pole and just looked at me. This situation just made me want to blog my lil heart out about how ridiculous some people are while they are on the train. Here are 3 simple rules that everyone should follow while riding the New York City subway trains. RULE #2: Be aware of personal space. I understand that people get comfortable and they do not like moving around on the trains. But we all should be aware that people need space. RULE #3: Do not sit on the train floor. Goodness! I know people are exhausted but do we really need to sit on the floor? AND! if you do decide to sit on the floor, do not sit directly in front of people. Please people be considerate and use common sense when riding the trains. And those are my 3 simple rules to making a train ride more delightful. Ha ha!!! OMG! I HATE POLE HUGGERS!